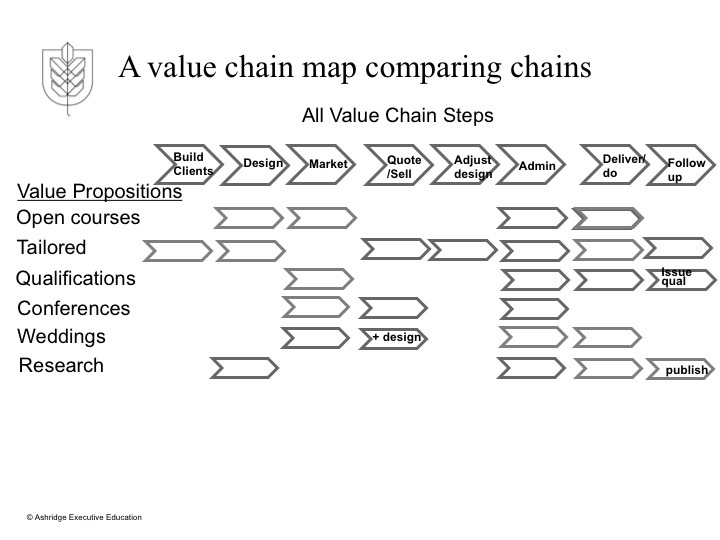 Over the years, I have become convinced that a value chain map is a more powerful and more easily accepted starting point, both in consulting and teaching, for operating model work (compared, for example, to a capability map). This blog explains what a value chain map is. 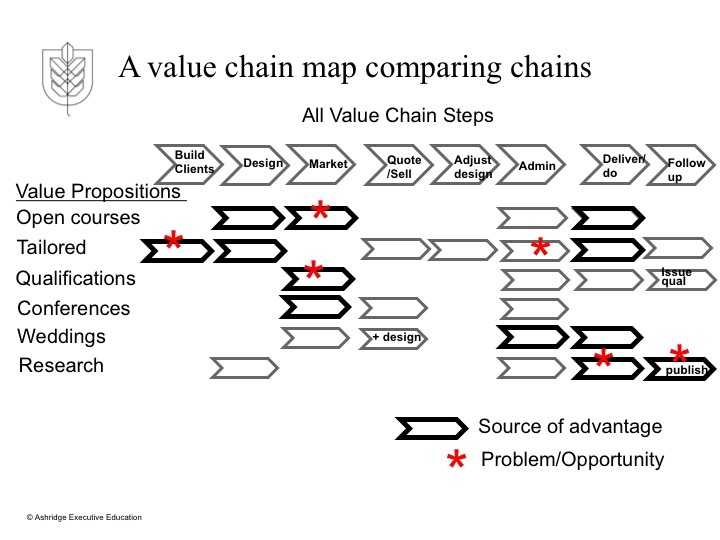 A Value Chain Map is a high-level process map or value stream map: the term value chain coming from the strategy literature – Michael Porter. I prefer the term value chain because it reminds me that we are trying to link operations to strategy. But any other term is acceptable so long as the tool does the same thing. To create a Value Chain Map, you first need to identify the different “value propositions” (the products or services) that the organization provides. Ashridge Business School provides tailored courses for executives, open courses, qualifications courses, research papers and books and even weddings using our beautiful building. An HR function might provide talent development, recruitment, remuneration and organisation development services. A factory might produce standard products and specials. Figuring out the best way of defining the value propositions is not a trivial task (see separate blog). Should I think of Ashridge as offering courses, research papers and weddings, or should I think of Ashridge as offering open courses, tailored courses, qualifications courses, etc, or should I think of Ashridge as offering finance courses, marketing courses, leadership courses, etc, or should I think of Ashridge as offering 1 day courses, 2 day courses, 3 day courses, etc? The answer should come from the strategy: how does the strategy chunk up Ashridge’s different services into groups/segments/offers and how does this link to the way Ashridge thinks about its customers ? If the strategy is silent on this issue, it is probably better to work on strategy than on operating models. It is helpful to keep the number of different value propositions and the number of steps in each high-level process to less than seven (aggregate if needed). The reason is that you need to be able to hold the whole Value Chain Map in your head at one time; and a matrix of 36 (6 value propositions with 6 process steps each) is about the maximum you can cope with. It is always possible to go into more detail later, as needed. When you have done high-level process steps for each value proposition, you can then create a Value Chain Map. Draw the process steps as chains of chevrons along the horizontal, placing different chains above or below each other. Then arrange individual process steps into columns of like capability. So that, in the Ashridge example, the “design” activity in each chain sits in one column and the “deliver” activity sits in another column, etc (see exhibit 1). Once created, additional information can be added to the value chain map (see exhibit 2). Identify which chevrons in each chain are critical success factors as opposed to commodity factors for delivering the chain’s value proposition. Identify in which chevrons the organization currently has difficulties or is under performing. For these problem chevrons, it is often helpful to go to the next level of detail: breaking the chevron down into five or so more detailed chevrons and considering where the problem is at the next level of detail. Identify how the organization’s costs or headcount divides amongst the chevrons. However, the main benefit of the Value Chain Map is that it provides a visual background for considering organization structure. The people doing the work in each chevron of the map could report in two ways: along the value chain to someone responsible for ensuring that the total value chain delivers the value proposition; or within a vertical column to someone responsible for a single capability across all the value chains. So, the people doing course design for open courses at Ashridge, could report to the head of open courses or to the head of course design for all types of courses. Fortunately, there is a rule of thumb to help you decide which way the people should report. The rule says that the default reporting line should be along the value chain (the design people for open courses should report to the head of open courses), unless significant improvements can be made to the value proposition by reporting in a different way. In other words, report along the value chain unless reporting by capability significantly lowers cost or significantly improves the value delivered. The reason for this rule of thumb is that it is easier to create the value proposition and adjust it to match changing customer preferences, if all of the people doing the work for this value proposition report to one person and are focused only on delivering this value proposition to this customer type. The rule of thumb means that the onus is on those who want to organize by capability to create a convincing business case. If in doubt, report along the value chain. The wonder of the Value Chain Map is that it gives a visual representation on one page, of the core work that needs to be done to deliver the products or services; and it provides the platform for thinking about organization structure. With a picture of the core work of the organization and how this work should be structured, you are already half way to an operating model. As readers of this blog will know, I am always interested in other frameworks (other than the Operating Model Canvas) because it is often possible to learn something or to see the same issues from a new perspective. even lighter blue boxes are bracketed as “Operating model” – Core business processes; Operational and technology infrastructure; Organizational structure, governance and risk controls; People and culture. The other two columns are “Key questions” and “Accelerators”. So what? First there is nothing in this categorization of business model and operating model that is different from Operating Model Canvas. But a couple of points are worth noting. First, the term business model is used to refer only to the front end of the Business Model Canvas. In other frameworks, such as PA Consulting’s framework, this is referred to as “customer model” or “value proposition model”. Business model includes customer model and operating model. So readers should be aware of the different ways different consultants use the term business model. 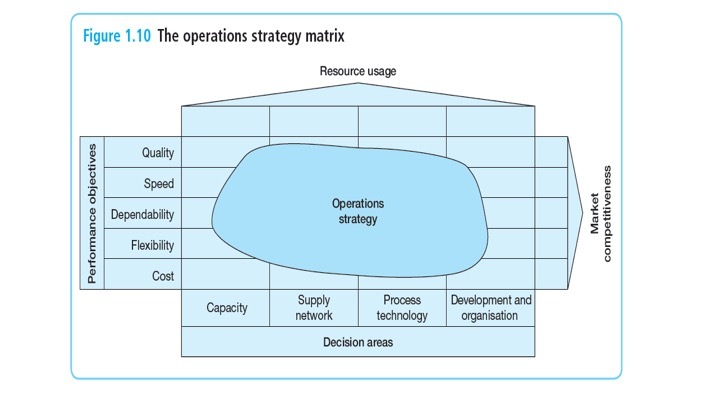 Second, in the operating model categories there is one for “Operational and technology infrastructure”. This combines digital and mechanical machines and applications, which seems odd for LNG companies who have drilling rigs and IT systems. 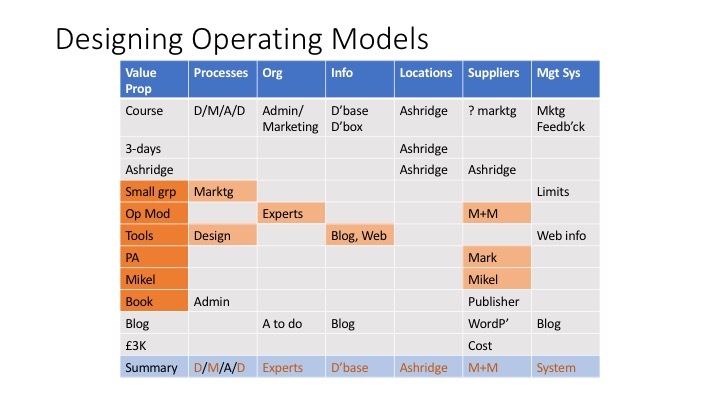 It also makes me think that the Operating Model Canvas lacks a good place for thinking about things like drilling rigs. When they come up, I typically think of them as part of the “core processes” and also think about them again when considering locations. But this framework gives them a bit more status. 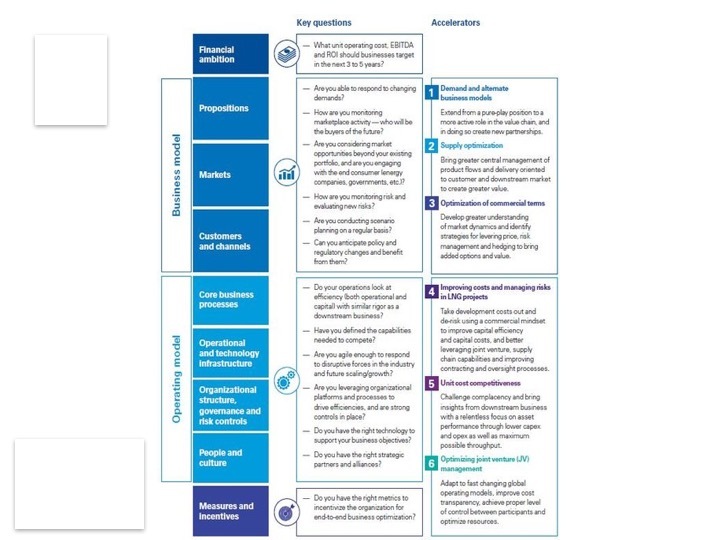 Third, the KPMG framework has a box for “Organisational structure, governance and risk controls” and a separate box for “Measures and incentives”. This seems a very odd split. The question in the next column against measures and incentives is “Do you have the right metrics to incentivize the organization for end-to-end business optimization?” which is a pretty odd question, but makes me feel that this should be part of the organization box. In the Operating Model Canvas the split is between the design of the organization – structure, people, incentive systems, culture, decision rights, etc – and the management system needed to run the organization – planning, budgeting, targeting, performance management, risk management and continuous improvement – and the scorecard that tells leaders whether they are on track. I think this is a cleaner split. The word governance, however, has always given me difficulties in this context. For a project, governance refers to the steering group and the design authority that the project needs to work with. For an organization it is partly the decision rights and committees, which I think of as part of organization design, but it is also the planning, budgeting and risk processes that I position as part of the management system. So the word governance cuts across different categories in the Operating Model Canvas. As a result, I have started avoiding the word where possible, yet its usage is growing and may be confusing people rather than enlightening them. But I am determined to have a go at this format for a business I know well to see if it can be made to deliver something more dramatically insightful, as I tried to do on pages 144 and 145 of Operating Model Canvas. At various stages in the last few years I have had a check list of trends (mainly tech trends) that managers should be considering when they are reviewing processes or operating models. Things like “automation” or “digitization” or “mobility” or “social media”. The basic idea is to encourage managers to think about whether they are exploiting these new technologies enough in their new process or operating model designs. So I am always on the look out for an article that synthesizes down all these different trends into a manageable number to think about. In 2017, two articles got particular attention from me, one from BCG and one from McKinsey. What should we take away from these two authoritative sources? First, neither includes the big fad of the last five months Artificial Intelligence (although it underpins two or three of the McKinsey list and two of the BCG list). Second, there are some notable similarities and differences. Both include automation and analytics. BCG has access to information, agility and simplicity. McKinsey has lean, digitization and outsourcing. The question to ask of any process or any operating model is “Are we exploiting the trends of ALODSAMOSA?” It is a bit of a mouthful, but quite catchy once you have said it a couple of times. What additional or different items would you suggest? What about printed manufacturing? What about “environmentalize”? What about dignity at work? And then there are age old concepts such as “specialize” or “empower” or “align”. I am working with a client at the moment on an “operational review”. I am still at the “explain the methodology” stage: one of my roles is to skill up the project team so that they can use the Operating Model Canvas and associated toolbox. The session today demonstrated the power of operating model work in helping challenge and crisp up strategy. The organisation has a mission statement, three strategic priorities, corporate values and so on. But the work we were doing today on a stakeholder map and a value chain map demonstrated some weak or unclear thinking in the strategy. When we laid out the stakeholder map we had a hard time distinguishing between those stakeholders that are “customers” or “beneficiaries” from those that are “business partners” or “suppliers”. The organisation is a charity. Some of the confusion was about the funders and don0rs. Were these funders suppliers or customers? This depended on whether the charity decided what work to do and then looked for funders to support the work (making funders into suppliers/business partners) or whether the charity was offering its services to funders and it was the funders who decided what work should be done. Frustratingly the strategy did not make this clear: the charity seemed to be doing both but the words in the strategy suggested that the charity was focusing on the first. Another confusion was about the logic for the charity work. When we picked a specific beneficiary and asked why the charity was doing work for this beneficiary, we were not sure whether it was to help the beneficiary as the end objective or to achieve some larger goal through helping the beneficiary. Again, the strategy documents and mission statement did not help us resolve this. Some similar confusions occurred as we worked on the value chain map. We tried listing the different types of customer/beneficiary that the organization seeks to help; so that we could articlate value propositions (services) and draw out value chains (processes) for each beneficiary. But this depended on answers to the previous questions. Was the organization trying to help funders spend their money or was the organization trying to help a particular beneficiary? Also, was the primary beneficiary the person receiving the service or the people who benefited at one level removed? Think for example of helping a disabled child in order to ease the burden on a family. Was the objective “ease the burden on families” or “help a disabled child”. In a future blog, I hope to be able to illuminate this example with more specifics. But, at the moment, the work is confidential and hence this material is well disguised. The core point I am making, though, is that tools like the stakeholder map and the value chain map, force strategists to make choices, construct hierarchies of objectives and clarify mission in a way that is often missing from the tools used in strategic planning. This is because it is hard to design the operations without making these choices. As a result, working on the operating model can lead to clearer and better quality strategies. Maybe all strategic plans should include, at the back end, an Operating Model Canvas, as a forcing device to encourage crispness and clarity. One conclusion we were able to make today: the first step in the project will need to be focused on clarifying the strategy. Once this is done, we can then consider whether the current operating model will need to change. I recently gave a talk at the European Organization Design Forum on the topic of agile organizations. This forced me to think deeply about what agile is and how it relates to organization design. So let me share some of these thoughts here and expand the topic to include operating model design. First a definition of agile: “being able to turn on a dime for a dime” and “being able to change faster and more cheaply than your competitors”. These phrases are taken from Craig Larman, who was part of the team who coined the term agile as being relevant to the lean and six sigma community. In this community, agile is associated with short-period (often six-week), test-and-learn projects, at the end of which priorities and direction can be reset based on what has been learned. It is also associated with “minimum viable product”: the way of testing a new idea. So what has it got to do with operating models or organization? First, when making change, an agile approach to the change is probably wise. Don’t try to plan it all out and then execute. Instead, make some change quickly and then reassess. Of course, in many tall hierarchies, the quick-cycle, test-and-learn approach is hard to make happen because, to get approval for change, top layers in the structure often want a fully-worked and costed business case. Changing the plan and the business case every few weeks is hard both administratively and politically. So one of the implications of agile is that we need to have decision processes in organizations that focus more on “intent” rather than “plan”, and decentralize achievement of intent down to teams that can operate in an agile way. Second, there are lots of components of organization and operating models that are not, and never will be, agile. In fact your ability to succeed in period A is often a function of your willingness to make commitments now that may cause you to be inflexible in period B. Think for example of a company competing for a contract with Tesco or Walmart. To win the contract, the company often has to demonstrate that it has built the capacity and developed the systems needed to serve this customer. This capacity and technology can then become legacy problems if the customer changes its needs. Yes you can build flexible capacity and systems, but typically these are more expensive than dedicated solutions: so there is a trade off. The choice of the head of the organization is another example of a decision that is typically anti-agile. Every leader has strengths and weaknesses. If circumstances change so that the weaknesses become a significant disadvantage, it typically takes a year or two before the head can be changed. If we think through the components of an operating model – POLISM – we can see the tensions that agile raises. A process needs to be “leaned” to deliver a particular value proposition. But this will make the process costly or less effective for delivering slightly different value propositions: the process becomes anti-agile. Organization structure, even if controlled by holacracy (the self organizing method), takes time to change: it becomes anti-agile. 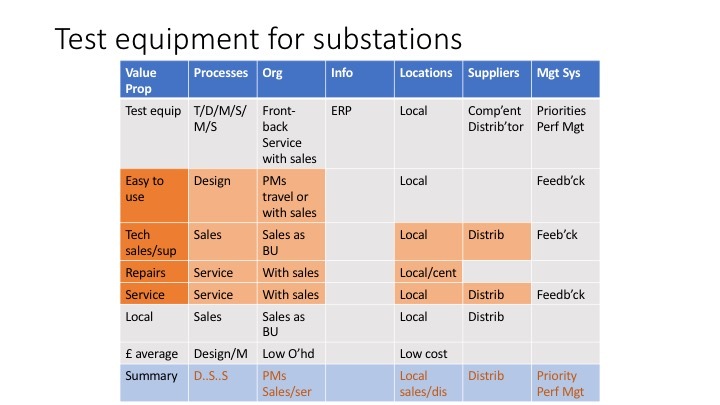 Location is expensive to change not just because of leases and the moving of people and equipment, but also because of other elements of the operating model that are influenced by location – supplier relationships, customer relationship, attractiveness for employees, etc. So location can be anti-agile. Legacy information systems are frequently a cause of lack of agility. But, there is often no way round the problem, especially with bespoke software. Supplier relationships can be anti-agile: effective relationships often take years to build. Finally, management processes and scorecards can be anti-agile. An organization that has been driven for ten years on a metric of sales margins, will take some years to convert to a return on capital metric or a sales volume metric. So, when we design organizations or operating models we are often deliberately designing in aspects that will be anti-agile. Nevertheless, there is still benefit to the agile thought. We need to think quite hard every time we make a design choice that is anti-agile, whether we are doing the right thing. The simple question to ask is “once the new design is up and running, if circumstances change, how long will it take to change to another design both from a political and executional perspective. ?” For those of you who have used the tool “The nine tests of good organization design”, you will recognize the ninth test – “the flexibility test”.